There are two ways to keep your outlets safe: tamper-resistant (TR) outlets and ground fault circuit interrupter (GFCI) outlets. Outlets with a TR and GFCI rating are the safest outlets that you can install in your home, as they protect against potential electric shock. TR outlets protect the outlet from tampering and user from shock via spring-loaded shutters. TR-rated outlets feature “TR” engraved into the outlet faceplate, typically between the two prongs. The shutters remain closed until the proper plug is inserted. This ensures that items like knives, forks, or loose jewelry are not able to access plugs, thus reducing electrical shock injury. GFCI outlets are protected outlets that monitor the electrical current and identify leaks in the circuit. If leaks are identified, the GFCI trips the circuit and stops the flow of electricity. This safety feature is ideal for outlets that are installed in areas where water is present, such as above countertops in bathrooms, laundry rooms, and kitchens. 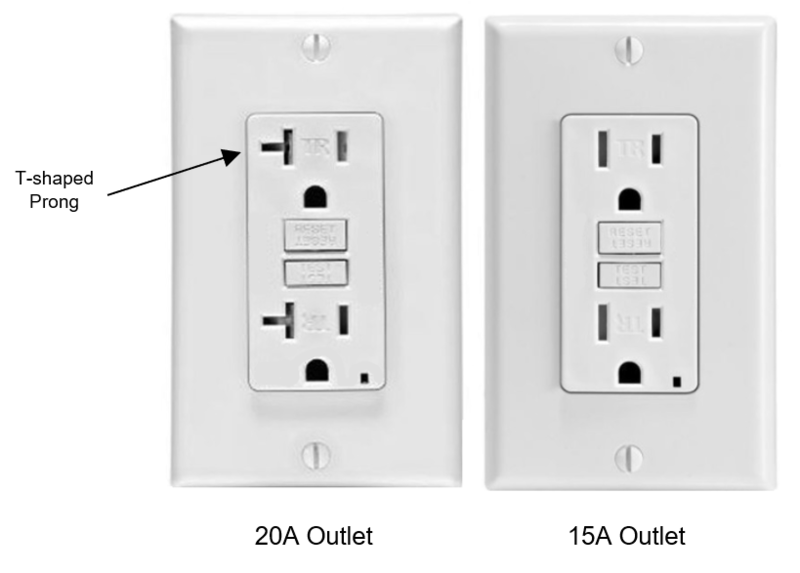 The following illustration depicts two tamper-resistant, GFCI-rated outlets in 15 and 20 amperages. Users should also consider the size of the wall box: GFCI outlets are larger than standard outlets, which can be limiting factor to installations. Always measure and consider the size of the wall box before moving forward with installing a GFCI outlet. Note that some local building authorities do not allow GFCI outlets. Users interested in GFCI-rated outlets must ensure that the breaker is GFCI rated as well; however, these are often more expensive than standard breakers and outlets. 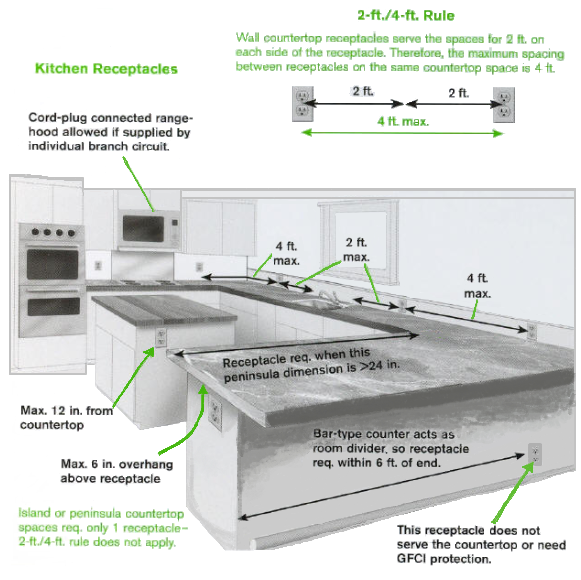 Basic electrical code establishes requirements for outlet spacing. The following guidelines are required when installing outlets in a kitchen environment: Do not install outlets more than 48 inches from each other. This ensures that no point on the countertop is more than 24 inches from an outlet, which prevents stretching a cord too far. 12-inch base cabinets topped with a counter or 12-inch walls require an outlet. Do not install an outlet more than 20 inches above a countertop. Islands and peninsulas require at least one outlet. Due to this island requirement, pop-up outlets are an ideal solution for providing power to this kitchen space.In summation, a receptacle outlet must be installed for each kitchen and dining area countertop wall space 1 foot or wider, and receptacles must be placed so that no point along the countertop wall space is more than 2 feet, measured horizontally from a receptacle outlet. Before making any changes to your electrical systems, consult with a local licensed electrician. Local electrical codes vary by county, and these codes prescribe the specific requirements for outlet type and placement.